Honors/Achievements: The first person in the United States to receive all three national service honors — the Outstanding Philanthropist of the Year Award from the National Society of Fundraising Executives, the National Alexis de Tocqueville Award of the United Way of America, and the Distinguished Service Award given by the Association of Governing Boards of Universities and Colleges. Ruth Collins Sharp Altshuler was honored with the 2002 Mary Harriman Community Leadership Award. Altshuler of Dallas has devoted her life to philanthropic and charitable interests and a variety of business activities. She served as vice chair of the Southwestern Medical Foundation, as chair of the Communities Foundation of Texas, and on the board of trustees for Zale-Lipshy Hospital. Altshuler, the first woman to serve on the Salvation Army Dallas Advisory Board, is a lifetime member of the National Advisory Board of the Salvation Army. She was the first woman to be elected to the board of Goodwill Industries and serve as vice president of the Goodwill Foundation. She was chair of the Highland Park United Methodist Church Executive Board, served on the Dallas County Grand Jury, and served on the board of the Dallas Citizens Council. She was also the first woman to serve as chair of the Board of Trustees of Southern Methodist University. 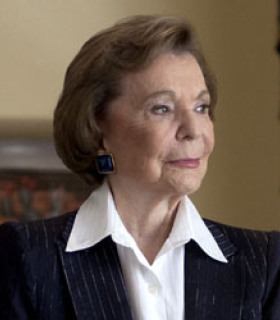 Altshuler is also a life trustee of the Hockaday School and the only woman to receive the Lifetime Achievement Award from the Junior League of Dallas. In 1991, the Texas House of Representatives honored Altshuler with a resolution commending her service to Dallas and the State of Texas. She is the recipient of many notable honors including the Linz Award, Golden Plate Award, United Way of America's 1993 Volunteer of the Year Alexis de Tocqueville Award, and the Humanitarian of the Year Award. She also received the Outstanding National Alumna Award from Mortarboard in 1997. In 1992, Altshuler was named Outstanding Trustee in the Nation by a private university and the Association of Governing Boards of Colleges and Universities. The National Society of Fund Raising Executives also named her Outstanding Philanthropist in the Nation in 1999.